Maltodextrin, Natural & Artificial Flavors (Milk), Citric Acid, Sucralose, Pectin, Calcium Silicate, and FD&C Yellow #6. Before consuming 212°™ seek advice from a physician if you are unaware of your current health condition or have a medical condition, including but not limited to, heart, liver, kidney, thyroid disease, psychiatric or epileptic disorders, difficulty urinating, diabetes, high blood pressure, cardiac arrhythmia, migraine headaches, enlarged prostate or glaucoma. Do not consume caffeine from other sources. 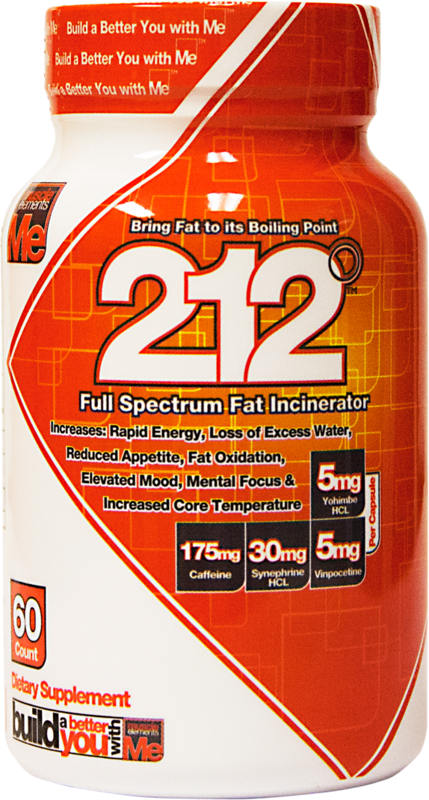 Do not use 212°™ if you have any pre-existing medical condition or if you are taking an MAO inhibitor, anti-depressants, aspirin, non-steroidal anti-inflammatory drugs or products containing phenylephrine, ephedrine, pseudoephedrine, or other medications or over the counter drugs containing stimulants, or any other form of medication. After 8 weeks of continuous use, discontinue for at least 2 weeks. Discontinue 2 weeks prior to surgery. Use only as directed. Not recommended for use by children under 18 years of age. Do not exceed recommended dosage. Consume a minimum of 120 ounces of water daily in conjunction with a healthy diet and regular exercise. Keep out of reach from children and pets. Maltodextrin, Citric Acid, Malic Acid, Natural & Artificial Flavors, Pectin Powder (Pectin [Standardized with Maltodextrin], Corn Syrup Solids), Calcium Silicate, Sucralose, Sea Salt, Acesulfame K, FD&C Yellow #5. Mix 1 scoop with 4 to 6 oz of cold water on an empty stomach upon waking. For maximum results, a second serving can be consumed mid-afternoon or 5 hours before sleep. DO NOT EXCEED MORE THAN 2 SERVINGS IN A 24 HOUR PERIOD. Drink at least 120 oz of water daily to avoid dehydration. Store in a cool dry place. Maltodextrin, Citric Acid, Natural & Artificial Flavors, Malic Acid, Sucralose, Pectin Powder (Pectin [Standardized with Maltodextrin], Corn Syrup Solids, Calcium Silicate, Acesulfame K, FD&C Red #40. Contains approximately 175mg of total Caffeine per capsule. Take 1 capsule on an empty stomach upon waking and assess tolerance to add additional capsule. Take 1 capsule after lunch. DO NOT EXCEED 3 CAPSULES IN A 24 HOUR PERIOD! Drink at least 120oz of water daily to avoid dehydration. Store in a cool dry place. Before consuming 212 seek advice from a physician if you are unaware of your current health condition or have a medical condition, including but not limited to, heart, liver, kidney, thyroid disease, psychiatric or epileptic disorders, difficulty urinating, diabetes, high blood pressure, cardiac arrhythmia, migraine headaches, enlarged prostate or glaucoma. Do not consume caffeine from other sources. Do not use 212 if you have any pre-existing medical condition or if you are taking an MAO inhibitor, anti-depressants, asprin, non-steroidal anti-inflammatory drugs or products containing phenylephrine, ephedrine, pseudoephedrine, or other medications or over the counter drugs containing stimulants, or any other form of medication. After 8 weeks of continuous use, discontinue use for at least 2 weeks. Discontinue 2 weeks prior to surgery. Use only as directed. Not recommended for use by children under 18 years of age. Do not exceed recommended dose. Consume a minimum of 120 ounces of water in conjunction with a healthy diet and regular exercise. Keep out of reach from children and pets. Aug 24, 2015 Muscle Elements 212: Don’t Just Burn Fat.. BOIL It!! 212° will also increase fat oxidation, elevate your body's core temperature which promotes thermogenesis, reduce body fat accumulation, and dramatically increase the removal of excess water. 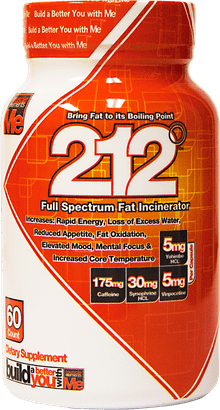 Bring Fat to its Boiling Point with 212°! Directions: Take 1 capsule on an empty stomach upon waking and assess tolerance to add additional capsule. Take 1 capsule after lunch. DO NOT EXCEED 3 CAPSULES IN A 24 HOUR PERIOD! Drink at least 120oz. of water daily to avoid dehydration.